Objects providing pictorial evidence of initiation rites in different Indo-European cultures. Credit: D. Anthony. “I remember saying early on in the dig that we were finding a lot of dog bones. But I had no idea how important they would turn out to be. When the team got to work analyzing all the animal bones in the lab, they identified the remains of about 51 dogs and seven wolves, as well as six canines that could not be classified as either. At other Timber Grave sites, dog and wolf bones never make up more than 3 percent of the total animal bones found. At Krasnosamarskoe, they made up more than 30 percent. “I don’t know of any other site in the world with such a high percentage of dog bones”. This is the way archaeozoologist Nerissa Russel describes the procedure of excavating Krasnosamarskoe, one of the most enigmatic sites in the history of modern archaeology. Situated in the Russian steppes north of the Black Sea, Krasnosamarskoe is an otherwise typical site representing the so called Timber Grave Culture, a nomadic culture that flourished in Northern Europe during the local Bronze Age. Still, the finding of an enormous amount of dog and wolf bones -also cut in unusual, systematic ways that did not resemble ordinary butchering practices- was a phenomenon its excavators, archaeologists David Anthony (Hartwick College) and his wife Dorcas Brown could not fully explain. The almost ceremonial cutting of these bones was reminiscent of a sacrifice. But why, and in what way? Enter the science of linguistics and especially the Indo-European language theory. It is generally considered that the people who lived at Krasnosamarskoe almost certainly spoke an Indo-European language, an event that implies cultural connections with a wide range of people inhabiting the area covering Northern and Central Europe, the Russian Steppes and India. Moreover, Proto-Indo-European (PIE), the language all Indo-European languages stem of (probably spoken between 4500 and 2500 BC), included words signifying certain cultural practices,which are well recorded in later Eurasian cultures. Such a word is “koryos”, signifying a group of young people acting like (and often getting inspiration by) wolf packs. The institution of youthful war bands that go on seasonal raids is so widespread in Indo-European cultures that historical linguists and mythologists concluded that it had to be a long-standing PIE tradition. In the ancient Celtic, Germanic, Greek, and Indo-Iranian traditions, young men often left their families to form warrior societies. “These were young guys on the edge of society who occasionally would steal cows, and you’d rather they were off stealing someone else’s cows,” says Anthony. “So they were expelled from their social groups and told to raid other communities.” In Germanic traditions, these bands of young warriors thought of themselves as wolf packs. A famous myth about the hero Siegfried has him donning a dog skin to go raiding with his nephew, whom he is training to become a warrior. In the Rigveda, an ancient Sanskrit text composed sometime before 1000 B.C., young men can only become warriors after sacrificing a dog at a winter ceremony and wearing its skin for four years, which they burn upon their return to society. Such mid-winter actions are also stated through other traditions, allowing scholars to support that in a distant past, young men became warriors during a mid-winter ritual that involved dog sacrifice (probably because of the physical resemblance of dogs and wolves).The archaeological context has provided iconographical evidence which supports the above traditions. A stele found in a tomb near Kivik, Sweden, dating from about 1300 to 1000 B.C., depicts eight hooded figures follow a leader. The depiction has been interpreted as showing a long-standing Indo-European rite initiating boys into the warrior class. Indeed, the number eight may have held some special significance to youthful Indo-European war bands. At a Celtic settlement in France that dates to about A.D. 100, eight horses and eight men were buried together. And in the Siegfried myth, Siegfried tells his nephew not to call for him unless attacked by more than seven men, “which is eight”, states Anthony. “Perhaps, koryos were ideally groups of eight young men, and that fundamental unit of warriors endured into later times”, posits Anthony. 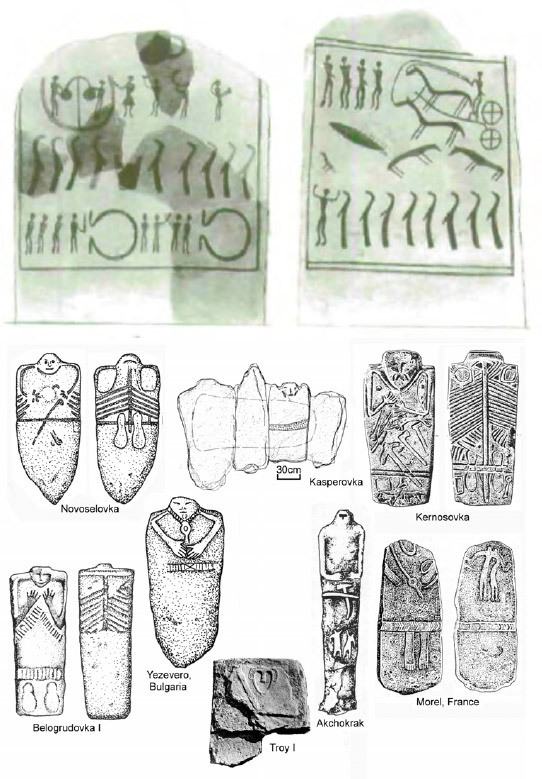 Going back to the finds of Krasnosamarskoe, they provide significant indications that the site had been used for such midwinter koryos initiations. But did this reconstructed tradition existed 4,000 years ago? Once they sent the canine teeth from the site to archaeozoologist Anne Pike-Tay, who studies incremental growth bands on teeth to determine what season an animal died in, the final piece of the puzzle fell into place. She was able to determine that cows sacrificed at the site were killed year-round.By contrast, 16 out of 17 canines were killed in the wintertime -16, which makes two groups of 8. For Anthony and Brown, this was a powerful piece of evidence that koryos existed hundreds of years before they were first mentioned in the Rigveda.